Join us on Wednesday, May 7th! 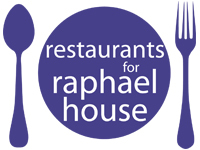 Please join us on Wednesday, May 7th, as restaurants around Portland recognize the importance of speaking out against violence by contributing a portion of their proceeds to support Raphael House! Mother’s Bistro & Bar is proud to be donating 10% of our sales from the entire day to this great cause! Follow the link below for a full list of participating restaurants.